Some posts are easy to write; after a bit of contemplation and rumination as we shuffle our gumboots around the Homestead, we stop procrastinating, sit down at the computer and let the story tell itself. Sometimes what we send out into the ether when we hit the publish button, all those documented triumphs, disasters, projects and dalliances, crazy ideas, unlikely dreams, downright idiotic errors, mixed up with a fair amount of slightly embarrassing navel gazing for good measure, is widely read and we receive wonderful feedback from you. Often it baffles us that a little snapshot of our blundering but well-intented existence, thumped out between weeding the glasshouse and picking up Farm Girl from The Kingdom of Nova (on a good day), is even remotely interesting to anyone that wasn’t actually here. Of course, there’s always those times when, well, maybe you were all a bit busy, or perhaps we didn’t quite hit the mark; we know we have a tendency to overwrite, or under proof read, or ramble about rubbish and you, like us, are busy people. Are you still with us? We know, this is rambling even for us. Incoherent even. It’s just that some posts are easy to write, as we said, and some…well, some are like this one. As those of you who have been wading through these missives for a while will know, it is a little over a year since we stepped over the line separating people who like to grow their own food and enjoy the odd egg sandwich and full on Homestead hippydom. The measuring stick, call it a book mark if you will, of this momentous happening was the arrival of our first goat, Nessie. Now Nessie, with her Freddy Mercury overbite and odd pairing of stocky, stumpy legs and graceful, streamlined body, was never exactly the epitome of goat perfection. 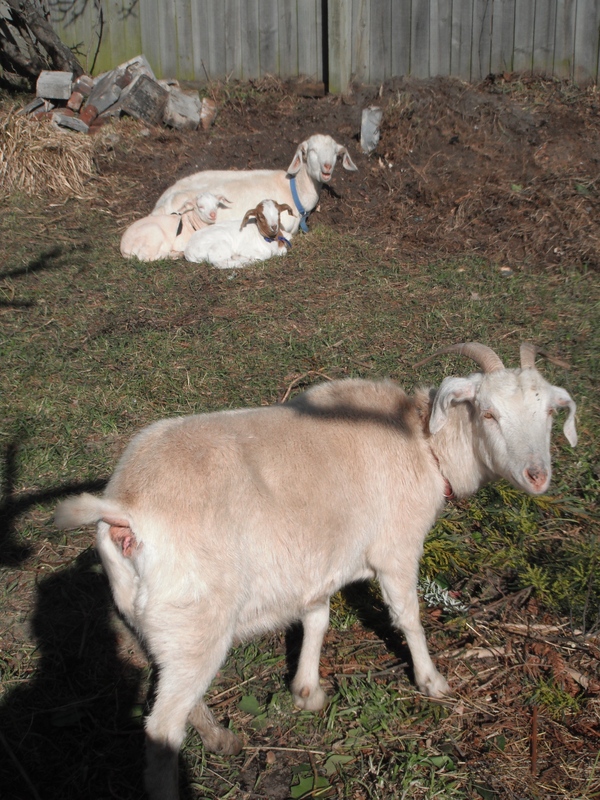 Putting looks aside for a moment because, frankly, none of us Homesteaders (with the exception of Farm Girl who can still play the “cute” card) are exactly pin-ups, Nessie didn’t seem to have read the How to Be a Goat guidebook. She didn’t like hay, for example. 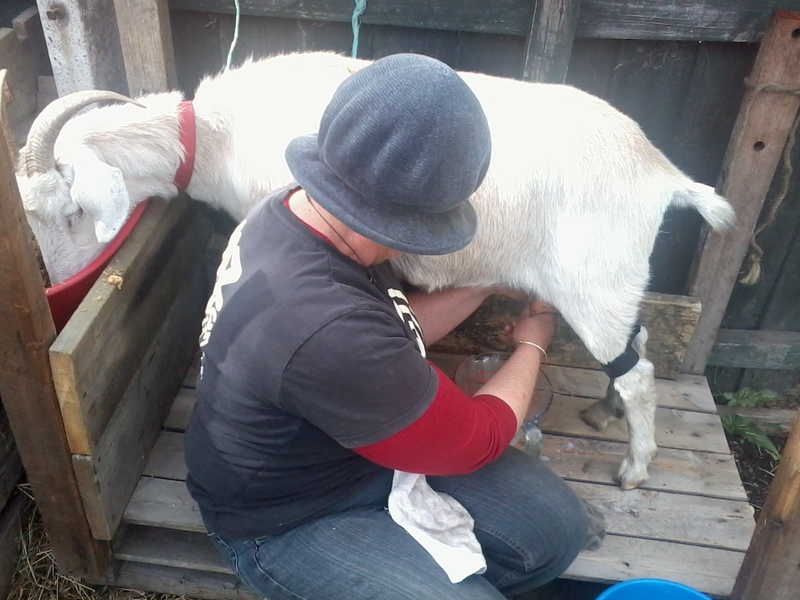 It caused us, as first time goat herders, huge amounts of hand-wringing that she shunned the thing that she was meant to consume in truckloads in order to keep her insides ticking over, according to the screeds of websites, books and anecdotal evidence we consulted. She would, however, do anything for a handful of parsley; any bolts for freedom were inevitably made in the direction of the parsley patch where she would dive, mouth first and legs tucked under, in order to grab as much of the booty as possible before being apprehended. A total coward when anything new or untoward happened (last Guy Fawkes night she spent most of her time with her head up The Milk Maid’s jersey), she was a merciless tyrant as the paddock matriarch. Luckily Leia was fast on the uptake, quickly learning not to get in the way of Nessie and the foodbowl, Nessie and the hayfeeder (yes, even though she didn’t eat the stuff), Nessie and the person at the gate clutching a couple of silverbeet leaves, Nessie and…well, Nessie and anything. Then there was the milking thing, the reason she was here in the first place. Yep, it didn’t really work. In the seven odd months she lived with us, the most we managed to coax from her misshapen, closely guarded teats (she could move like a turbo charged tap dancer) was 250 mls. Okay for the odd cup of coffee, but not exactly what you’d call paying her way. So, we agonised and stalled and discussed and argued and to-ed and fro-ed and finally we did it: we sent Nessie back to the farm from whence she came to live out her days. The Farmer would regularly update us on her antics; a change of address hadn’t exactly slowed her imaginative, inventive nature down at all. Sometimes we would visit; she would always hang back a bit, pretending she didn’t know who we were right up until the moment we’d stopped to pat one of her paddock mates. Then outrage at our betrayal would overcome her, and she’d thunder over, shunting the unfortunate target of our attention if given the chance. Yep, She was doing fine except for one small thing. Out at the farm, they had seen her through a couple of long, drawn out, painful birthings resulting in stillborn kids, and they agreed with us that she should be retired to post of eccentric, bossy, maiden aunt paddock muncher. No more babies for her. 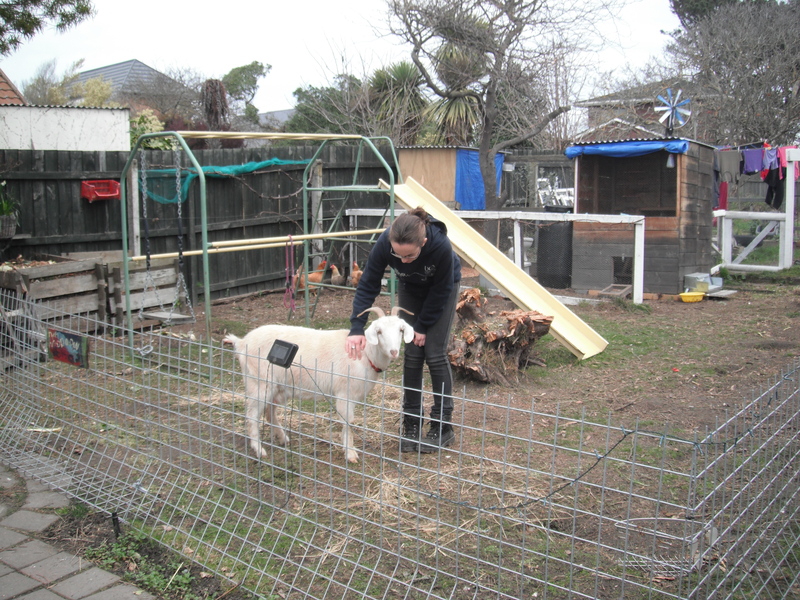 But things went a bit wrong, with power cuts rendering electric fences ineffective and Nessie’s inventiveness being hard to combat in an environment where students aren’t always aware of tricky goat ways. When we visited on Sunday for Farm Girl’s birthday, Ness was in the beginning stages of labour. We spent a lovely time with her, patting her and fussing over her, telling her how much we missed her and how everything would be alright. Then it was time to go home, because Nessie wasn’t under our care anymore, and that’s how it goes. In the night there was a storm as befitting the Spring Equinox. Amid it all, in the hail and wind, Nessie gave birth to two kids. One, a wee girl, survived. Nessie didn’t. It would be naive to think we would never have to experience something like this. We went into this way of living with our eyes wide open and this is, when all is said and done, just another chapter in the Union Homestead story. But right now, as we type this, we’re working our way through a mountain of ‘what if’s, ‘ if only’s and ‘how could we’s despite knowing in our hearts we would have done exactly the same thing again, given a second chance. Gorgeous, infuriating, curious, funny, grumpy, naughty, clever, bossy, whimpy Nessie: you taught us so much. Where ever you are, we know you’ll be stamping those hooves and keeping everyone in line; making sure things get done, as they still do on the Homestead, The Nessie Way. 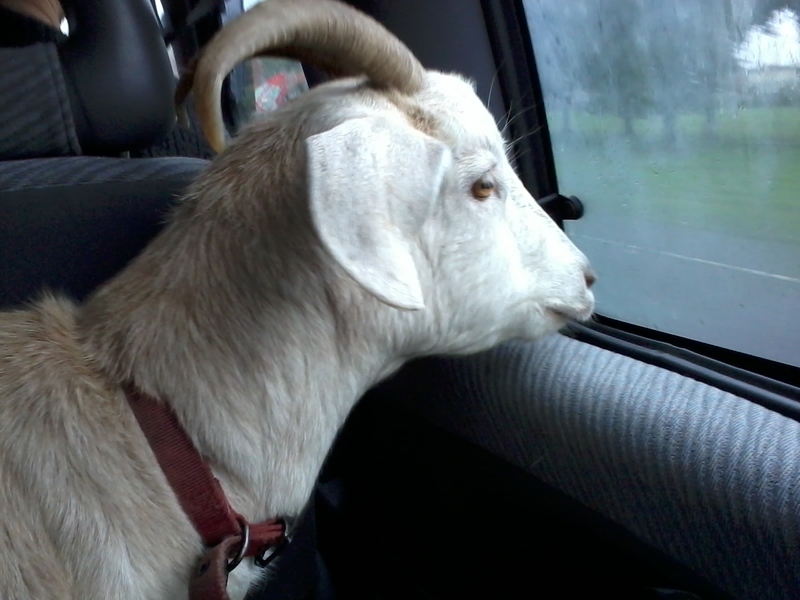 This entry was posted in Goats, Union Homestead and tagged animal loss, animals, Aotearoa, Christchurch, death, farm. farmlet, herd managament, Homestead, homesteading, loss, New Brighton, New Zealand, Otautahi, sadness, small holding, urban farm. Bookmark the permalink. ← A Fall in Spring. It is interesting to read about a life so different from mine. I enjoy your musings. Thanks so much for taking the time to read them. Thanks for your lovely comment. Indeed for better or worse, Nessie shaped our goat herding techniques. Nessie may be gone but her memories and lessons she taught live on. Hopefully her wee lass of a kid will also and maybe carry some of her spirit. It is difficult when an animal dies but it happens on our homestead too. Reports are that the wee girl is very tenacious – a chip off the old block. It was a nice post and got across just how much Nessie added to your homestead. As I am writing this, I am glancing over at a very old dog who will be leaving us soon. Loss is inevitable, but renewal and holding onto our memories is the compensation for those who embrace life. On a small farm, each and every animal has a name, personality, and becomes an extended member of the farm family. To loose one is always hard but the memories are nice to hold on to. This stuff never gets easier. And we wouldn’t want it to, right? Not really. What’s the point of spending all that time caring for an animal and not – caring? We can’t always be there to fix, to prevent, to rescue. Kind of like with our children, don’t you think? We invest all that time and love and effort and angst into them, train them and cajole them and nag them, and then they go out into the world without us and do the most amazingly risky things (fortunately, we often don’t find out till later). And sometimes they get through it fine, and sometimes they don’t. That was you and me once. More than once on my part :). Bad things happen, and sometimes we just have no control. But you gave Nessie a good home while you had her, and she clearly bonded with you. She lived in a good place when she was birthing that last time, and it wasn’t lack of care and attention that caused her death. She had difficult births once too often. And not in vain, as one of her kids survived. I do so feel for you over this awful time in your lives. We’ve been there too and we’ll be there again. It’s completely worth it. There will be only one Nessie in your family lore, but there will be other characters just as memorable (especially if they’re goats – they’re all characters, aren’t they?). I wonder if I will EVER write a short comment on your blog? Probably never, the track record isn’t good so far. I would be very disappointed to open up a one line comment from you so don’t go changin’ 🙂 I totally agree that there is little difference between caring for animals and family and yes, I certainly did things in my youth that I shudder over now…enough said. In the end, it’s just that whole circle of life thing that makes this way of living so right and as it should be, at least to my soul, and when the sun is shining and everyone, human and animal, is happy the world is a wonderful place. then you get this sort of thing, and it’s just as real and valid and in it’s own way right. What lovley story…each animal inour live teaches us so much. 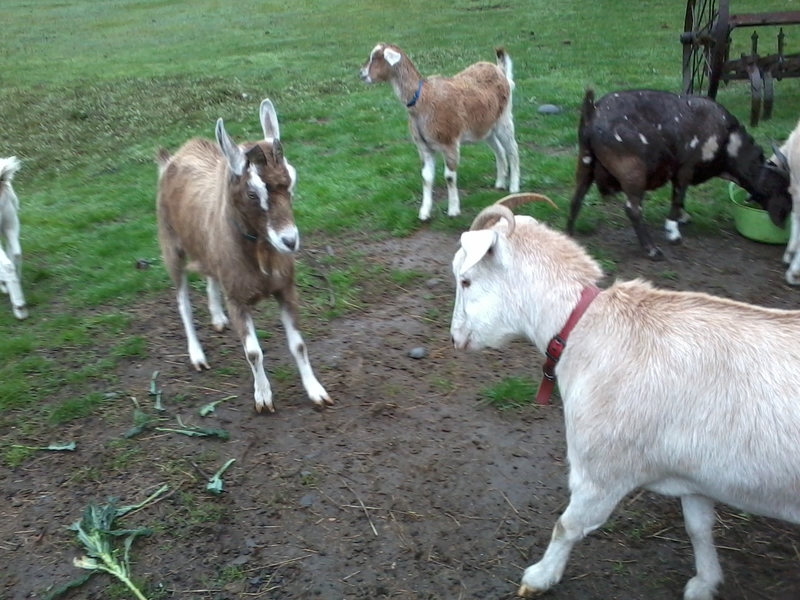 I always thought that goats have great personalities and yuor story confirms it. And Nessie had a good live with wonderful people! Thanks, Johanna. She was a real character and we’ll miss her heaps.